Two of my favorite things are crocheting and baking cakes. In this pattern I combined them both, in a crochet cake! I made this for Crochet Today’s first birthday, and it’s still one of my favorite designs. It’s silly, but it’s fun, and it always makes me smile. The cake itself is in my office and I always get a kick out of it. If you don’t know quite what to do with a crochet cake, you can fill it with stuffing to make a whimsical pillow! Gauge: Rounds 1–8 (of Cake Top) = 4"/10cm diameter using A and size H/8 (5mm) crochet hook. Remember to check gauge for best results! Gauge Swatch: With A and H/8 (5mm) hook, ch 4; join with sl st in first ch to form a ring. Rounds 1–8 Work Rounds 1–8 of Cake Top. Resulting gauge swatch should measure approx 4"/10cm in diameter. Adjust hook size if necessary to obtain correct gauge. Decorate your cake however you like! Substitute crochet flowers for the circles, or embroider a message on the cake top. Before adding the embellishments, place the Cake Top and Sides over the styrofoam form to mark placement of the various elements. With A and H/8 (5mm) hook, ch 4; join with sl st in first ch to form a ring. Round 1 Ch 1, work 6 sc in ring; join with sl st in first sc – 6 sc. Round 2 Ch 1, 2 sc in each sc around; join with sl st in first sc – 12 sc. Round 3 Ch 1, sc in first sc, 2 sc in next sc, [sc in next sc, 2 sc in next sc] 5 times; join with sl st in first sc – 18 sc. Round 4 Ch 1, sc in first 2 sc, 2 sc in next sc, [sc in next 2 sc, 2 sc in next sc] 5 times; join with sl st in first sc – 24 sc. Round 5 Ch 1, sc in first 3 sc, 2 sc in next sc, [sc in next 3 sc, 2 sc in next sc] 5 times; join with sl st in first sc – 30 sc. Round 6 Ch 1, sc in first 4 sc, 2 sc in next sc, [sc in next 4 sc, 2 sc in next sc] 5 times; join with sl st in first sc – 36 sc. Round 7 Ch 1, sc in first 5 sc, 2 sc in next sc, [sc in next 5 sc, 2 sc in next sc] 5 times; join with sl st in first sc – 42 sc. Rounds 8–15 Continue working in rounds as established, working one more sc between increases, until there are 90 sc. Do not fasten off. Rounds 16–32 Ch 1, sc in each sc around; join with sl st in first sc. Round 33 (scallop edging) Join C with sl st in any sc of Round 32, 2 sc in next sc, 2 hdc in next sc, 2 dc in next sc, 2 hdc in next sc, 2 sc in next sc, *sl st in next sc, 2 sc in next sc, 2 hdc in next sc, 2 dc in next sc, 2 hdc in next sc, 2 sc in next sc; repeat from * around; join with sl st in first sl st – 15 scallops. Fasten off. Rounds 1–15 Work Rounds 1–15 of Cake Top. With B and F/5 (3.75mm) hook, ch 4; join with sl st in first ch to form a ring. Round 1 Ch 2 (counts as first dc), work 12 dc in ring; join with sl st in top of beginning ch – 13 dc. Round 2 Ch 3, 2 tr in each dc around; join with sl st in first tr – 26 tr. Fasten off. Round 3 Join C with sc in any tr, sc in each remaining tr around; join with sl st in first sc – 26 sc. Fasten off leaving a long tail for sewing. With D and F/5 (3.75mm) hook, ch 4; join with sl st in first ch to form a ring. Round 1 Ch 2, work 10 dc in ring; join with sl st in top of beginning ch. Round 1 Ch 1, work 10 sc in ring; join with sl st in first sc. With bread knife, trim upper edge of cake form to create a rounded edge. Hold knife at a 45- degree angle and cut away approx 1⁄2"/1.5cm around upper edge. Using long yarn tail and yarn needle, sew large circle to center of Cake Top, sewing small stitches through back loops of last round of circle. Using photograph as a guide for placement, sew medium and small circles in the same manner. With D and yarn needle, embroider modified lazy daisy stitches in a ring around the large circle. With C and yarn needle, embroider chain stitches in swag pattern to connect all medium circles. With B and yarn needle, embroider chain stitches in swag pattern to connect all medium and small circles. Place Styrofoam cake form inside Cake Top. Place Cake Bottom on bottom of cake form. With yarn needle and A sew Top to Bottom. A really pretty idea to decorate a little girl's room. In reviewing the pattern it really is not that difficult to make. It just uses a basic stitch for the body of the cake. You will however, have to have some basic embroidery skills, which I do have but have not USED since I was a girl. So this may be a work in progress for me. I would like to do it in shades of blue for the embroidery and keep the cake that pretty ecru color! The cake is just gorgeous - already I can imagine its many uses: a keepsake 21st cake; a gift for my granddaughter's 2nd birthday in May; my husband's 50th in a few days - I better get off the laptop and start crocheting if it's to be finished in time! Thank you, Brett, for sharing the pattern. I wouldn't make this unless it had a practical use. I like to crochet things that are useful as well as beautiful. a shawl for instance. I don't crochet decorative items, I really would prefer making a real cake and sharing it with a friend or having a party. I would make this cake. I just finished crocheting a 3-tier cake with calla lily bunches that will be the centerpiece for one of my dessert table at my wedding reception. The question posed in the e-mail I received was: Would you make this Crochet Cake Confection? Why or why not? Is it an adorable decoration? Or would you rather spend your time making edible cake? My answer: Surely you jest! 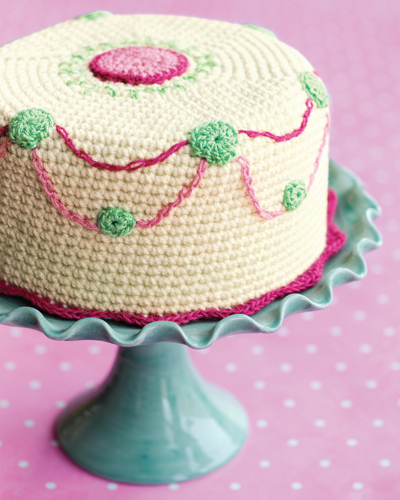 Even if I COULD make my hands do whatever they have to do to make this crocheted faux cake, I wouldn't. Sorry, to break the news to you, but this is not so much n adorabe decoration as a tacky craft item, so tacky, that even my grandmother, who had doilies everywhere and crochet-edged pillow cases, wouldn't have kept such an item in her house. Furthermore, if somebody presented me with this item as a gift, I'd have to muster every bit of acting ability to bely my horror and disappointment. But seriously, folks, if one desires to make a fake cake -- the French have a phrase for such things, namely "Trompe L'Oeil," or fool the eye; and that thing ain't foolin' anybody's eye! -- there are so many other more suitable media for such a project, than crochet. There's ceramics of various kinds; glass; wood; even other fiber-crafts, like felting, quilting, and soft-sculpture -- a well-executed cake-shaped pin-cushion would be a nifty gift item -- or polymer clay. Even Play-Dough would be a more suitable medium to make realistic-looking fake cake! I suppose I'd prefer making a real cake. However, I'm not all that into doing fancy decorating for cakes. I will make this. I might use brown, though. It would look like chocolate and that's my favorite. I have my husband's grandmother's covered cake plate on the buffet in the dining room and I think it would be great to have this in there. I would certainly much rather have a real cake, but when I do make cake it doesn't last quite long enough to be considered decorative. Good points, to display and enhance a beautiful cake plate, a fake cake might be a good way to go. but maybe not in crochet. still to each his own. Yes, I would love to make this if I were talented enough to do so! It would be so cute as a display in my glass server when I'm not using it for a real cake! I have made it for a friend who was seriously trying to lose weight. She was thrilled. It has now become part of all our birthday celebrations. The marvelous traveling cake. I would rather bake an edible cake that everyone would enjoy eating. I am afraid most people would be disappointed in a cake they can't actually eat. I have seen a pattern for a knitted cupcake and I think that would be fun to make. It would not take as much time or yarn and it is small enough that the person I give it to could keep it as a memory of a celebration or family gathering. I think it's adorable! It would make an ideal box cover (that held a special gift?). It would also be perfect for a special person that might not like or, due to health reasons, not able to have sweets. This is a great idea! Thanks for sharing it! I wouldn't make it unless it fit over a glass cover that held a real cake inside. Then it would be cute for say surprising someone with a birthday cake etc. or using for transport. But for just on its own a waste of time. To answer the e-mail, I absolutely would NOT ever make this. This is completely ridiculous! Why!? I couldn't find the Red Heart Luster Sheen even on the Red Heart web site.